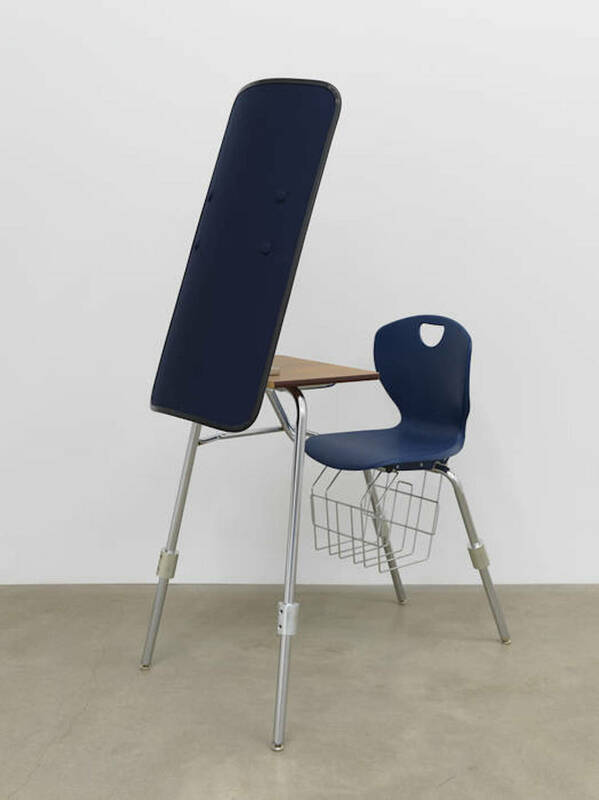 American Artist, I'm Blue, 1, 2019, school desk, hardware, ballistic shield, navy blue fabric, books, 66 x 24 x 35". Facing the video monitor are six school desks that have been outfitted with fabric-covered ballistic shields. Books about police psychology have been placed atop and beneath the desks. Volumes including The Proverbs 31 Police Wife (2018), Behind the Badge: 365 Daily Devotions for Law Enforcement (2018), and the inflammatory Black Lies Matter: Why Lies Matter to the Race Grievance Industry (2016), by the self-declared black “race realist” Taleeb Starkes, are from a small library curated by the artist. Starkes’s position as a mouthpiece of the alt-right represents the flip side of the blue-skinned polemicist/lecturer—though they are both equally scarred by racial trauma.